One year ago today, I landed at Logan Airport in Boston, still drunk on Tokyo, 13 hours with Japan Airlines, Natalie Portman in The Black Swan, twentysomething hours without sleep and a glass or two of wine. I fell comfortably into the arms of my family; the young children — who had not been told of my pending arrival — fainted on cue; lasagne and Girl Scout cookies were fed to me and I fell into a deep sleep for exactly one week. I knew then that it would be a good long while before I returned to Asia. My father had suffered a 1-2-3 punch of illness and injury during my last two years in Korea, and small children were growing at alarming rates among my brethren. I loved living in Asia; it treated me so well. But I’d outgrown the distance separating me from my people. The distance separating me from ovens and microbrews and not-needing-a-translator-for-everything. So when a friend offered me a position as his Art Director at a small agency in a small New England town on the New Hampshire seacoast, I jumped. What I didn’t know at the time was that I would stop writing in this space. I had stockpiled stories and photographs; I had plenty of adventures still to share. But transitions, they take a lot out of you. Complicate matters with transcontinental moves and culture shock, and you can simply multiply that by one hundred. Also, it turns out that when you’ve been 14 timezones away for a number of years, people get a little grabby upon your return. I’m certainly not complaining. That was what I had wished for. My people being close and grabby. But when your social sphere has long been condensed into a very manageable circle of precious people and suddenly it quadruples in size, a girl’s free time to write in her diary begins to vanish. And life gets busy and you have to run a marathon and next thing you know, it’s 2012. This last year has been very good to me. I have learned a lot, I have done a lot and I have laughed a lot. Returning to the US was much easier than I’d anticipated, and I can truthfully say that I have not once regretted moving back. In many ways it was too seamless, too quickly forgotten, too happy to be home. But there is a wistfulness and homesickness for Asia that is marked in unexpected milestones and odd markers of time. Stumbling on a plastic LOTTE bag* that transported gifts back in my suitcase, now carrying my lunch to work. 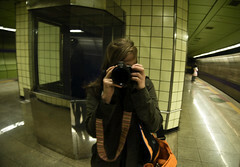 This time last year I was walking through Apgujeong with Youngdoo, Mel and Hyunyo snapping photographs. Discovering a full pack of makeup remover cloths from the Faceshop, their aloe scent transporting me to my Sinchon bathroom every time I use them. When my tube of Wah-Eee-Tuh Suh-pah-kul toothpaste ran out (that’s Korean for “White Sparkle”), I spent days trying to extract every last drop. 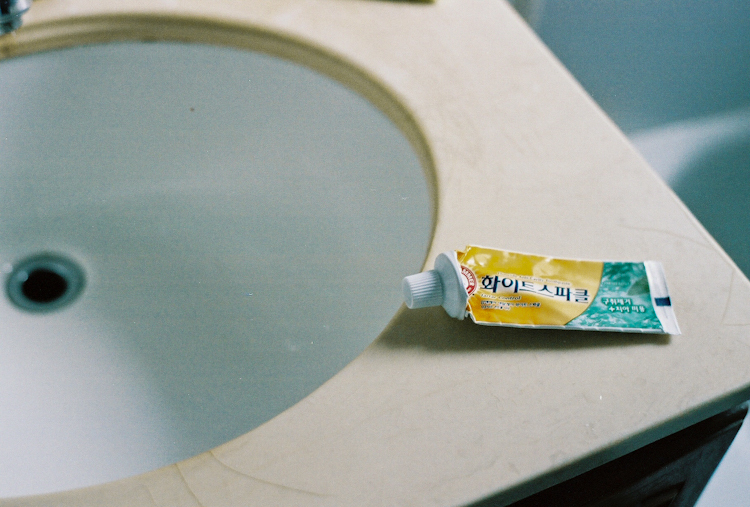 It’s not even Korean toothpaste. It’s Arm & Hammer. But those everyday products hovering around me, lingering in corners and pockets and new apartment drawers, made me feel that I wasn’t so far away from my life in Korea. That my days of wonder and magical discovery hadn’t been replaced with normal, ordinary everyday. I’m not done with Asia; not even close. But there is also the whole rest of the world. And now I’m embarking on another grand adventure, closer to my people. I’m not sure yet how these pages will transform on US soil, but I have an idea. And lots of stories left to tell. 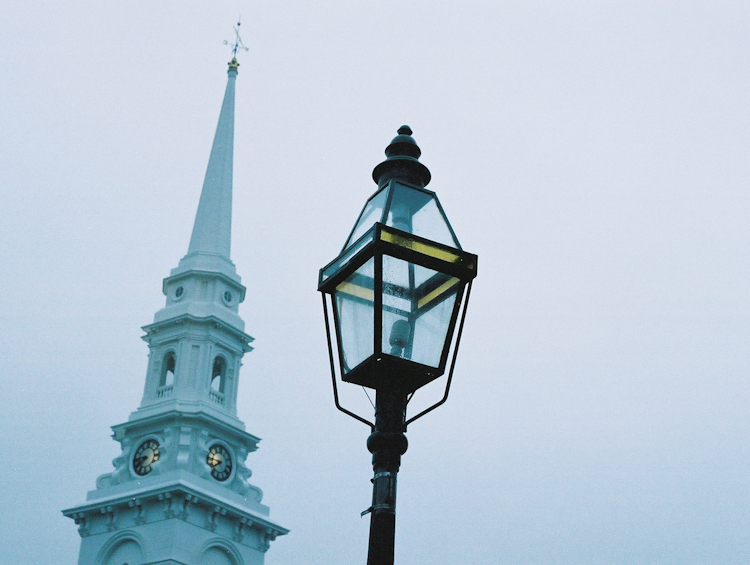 This entry was posted on Friday, March 2nd, 2012 at 10:12 pm	and is filed under Film, New England and tagged with coming home, Portsmouth. You can follow any responses to this entry through the RSS 2.0 feed. So nice to see you blogging again. Glad it’s been a good year. You know, now that your mention it, your teeth *have* been missing that Wah-Eee-Tuh Suh-pah-kul, lately… Beautiful post, Steph. Welcome back to this space, and cheers to this next grand adventure. p.s. – Has it really be A WHOLE YEAR?? Oh my god Carolyn. Thank you. Somehow my settings got reset to default to only contacts for comments on new uploads. Which made me realize you aren’t a contact, which is doubly embarrassing! FIXED! it doesn’t matter how long you are away from this space, I love every word you write upon your return. I enjoy reading your blog and looking at your photography so I am glad to see you back. well, hello! i love that you are here. as in here, and as in here on us soil. so much better a chance i might see you again. xoxox. i cannot believe it’s been a year. You’ll do something magnificent with your stories untold. (I have the LOTTIE website music playing as I type this). when S and I travel, we raid apotheke’s and markets for everyday items and savor them for months upon our return… it’s one of my favorite travel habits. So I can only imagine the *aching twinge* of your heartstrings pulling in the attempt to squeeze the last droplet of arm and hammer korean toothpaste. And, uhem, HELLO! I hope I get to see you soon. You are made of grand adventure. So great to see you blogging again, I really enjoy this blog! So glad to read your writing again. nice to hear about you again! This post gives me chills! It was so lovely to meet you at Jess and Eli’s. Sending you happy thoughts from Atlanta. Oh Lisa! I had such a great evening meeting you! Move back! Best wishes to you both on your new life in Atlanta and please come visit often! How lovely to have found your blog today. It’s such a beautiful space, with such a distinct voice. I’m going to go browse some more.